A star is born from the gravitational collapse of a cloud of gas and dust. Yet not all of the material ends up in the star, and instead forms a flat protoplanetary disk that surrounds the new star. Over time, the materials in this disk coalesce to form planets, moons, asteroids, and most other objects you might expect to find near a typical star. Figure 1. 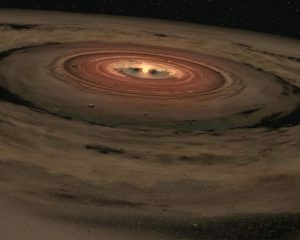 Artist impression of a protoplanetary disk around a star (source: jpl.nasa.gov). Since protoplanetary disks are flat, the expectation is that all of the planets and objects orbiting a star that formed out of a protoplanetary disk should orbit on a single plane. So when we find stars with planets that orbit at multiple different inclinations, this raises questions. A recent astrobite discussed such a case, where an exoplanet was observed orbiting on a completely different plane than the other exoplanets in that same system. But we needn’t look that far to find deviations like this – our very own Solar System exhibits several features that don’t line up, so to speak. Inclinations and Eccentricities and Truncations, oh my! For the first 30 AU around the Sun (until right around where Neptune orbits) things are relatively “well-behaved”: most planets’ orbital inclinations only differ from each other by 1-2 degrees, and no planet has an inclination of over 8 degrees. But beyond Neptune, in the Outer Solar System, orbital inclinations are considerably higher. Pluto, recently demoted from planet to dwarf planet, is one example; its orbital inclination is over 17 degrees. The same trend exists for orbital eccentricities, which tend to be significantly larger for objects beyond 30 AU compared to those inside the 30 AU cutoff. A similar pattern also exists in the Solar System’s surface density profile, which can be obtained by smoothing out the cumulative mass of Solar System objects (planets, moons, asteroids, etc.) to approximate what the Sun’s protoplanetary disk might have looked like. The surface density profile gradually declines until ~30-35 AU, where it drops abruptly by a factor of nearly 1000 (a phenomenon often referred to as disk truncation). Coincidence? Perhaps not. Figure 2. The orbits of select objects in the Solar System. 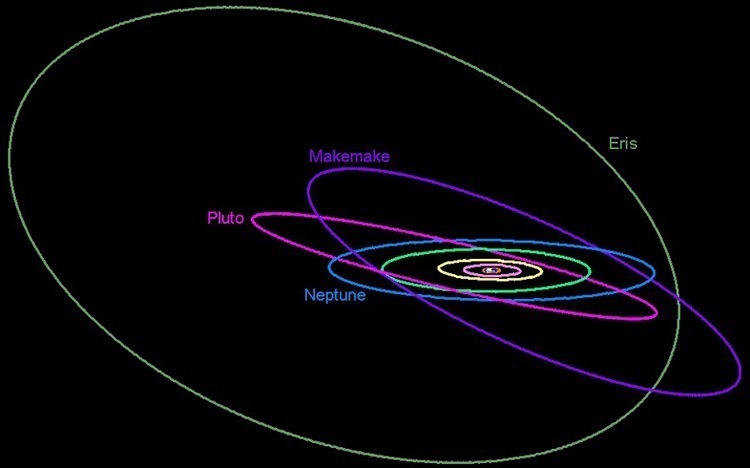 Neptune’s orbit and the orbits of the planets interior to Neptune (not labeled in the figure) are constrained to a thin plane, but the orbital inclinations of the dwarf planets beyond Neptune (Pluto, Makemake, and Eris are shown here) are significantly larger (image credit: journalofcosmology.com). Astronomers seek to develop theories that can help explain these peculiar features in the Solar System. One proposed explanation claims that the existence of a yet undiscovered far away planet (sometimes called Planet 9) could cause these effects on the outer Solar System. A second possible explanation, involving a supernova going off near the Solar System in its early days, was covered in another recent astrobite. Today’s paper offers yet another explanation – what if a star flew by our Sun early on, ‘stealing’ a bunch of the outer material from the Sun’s protoplanetary disk with it, and throwing what was left into inclined and eccentric orbits? To test this so-called stellar encounter theory, the authors simulated the Sun surrounded by a smooth, flat disk composed of test particles, and then checked what happened after this system encountered another star (AKA “the perturber”). They tested a broad set of initial conditions by varying the perturber’s mass, how close it came to the Sun, and the inclination of its trajectory with respect to the disk of test particles. In all cases they started with a disk that extended much further than the current Solar System does, and selected only simulations in which the fly-by truncated the disk at 30-35 AU, similar to where the Solar System’s density drops off. They next checked which of the remaining simulations reproduced other features of our Solar System, and in particular, which were left with a sparse population of objects at inclined and eccentric orbits. Figure 3. Three simulations from today’s paper, showing the trajectory of the perturbing star in black. Going from left to right, the perturber masses are 0.5, 1, and 5 Solar masses. The top row of panels depicts the average positions of the particles that remain after the fly-by, colored by how eccentric their orbits have become (note the black circle around 30 AU, the radius within which almost all particles are blue, meaning they all have very low eccentricities). The bottom row of panels indicates the initial positions (before the fly-by) of the different eccentricity populations shown in the top row, with the grey regions signifying particles that became unbound due to the perturber (Figure 1 in the paper). 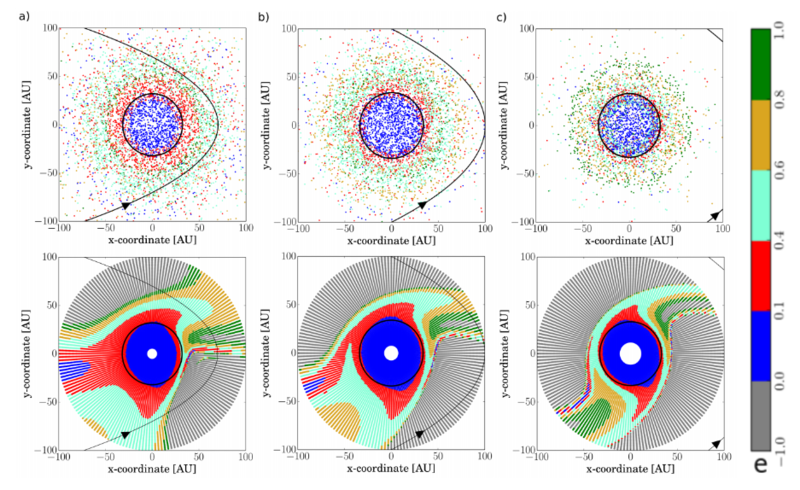 The authors report a good fit to the observed properties of our Solar System for a broad range of initial conditions, with the best fits coming from perturbers with masses ranging from 0.5-1 Solar masses. The simulation that most closely resembled our Solar System was obtained from an encounter with a star half as massive as the Sun passing 100 AU away from the Sun. In addition to this success, there are two further noteworthy triumphs of the fly-by theory. First, it only takes a single fly-by to reproduce the features the authors originally set out to explain. And second, beyond solving the questions that were originally posed, the simulations also provided natural explanations to several additional unexplained features of our Solar System, including the mass ratio between Neptune and Uranus, and the existence of two distinct populations of Kuiper Belt objects. Convinced? Well, you shouldn’t be, at least not yet. As the authors point out, showing that even only one event is enough to reproduce the observed effects is meaningless until we can quantify how likely it is for an event like that to happen in the first place. Sunny with a chance of fly-bys? For our Solar System, fly-bys have been extremely rare in the last couple of billions of years. But the good news is that stars like the Sun are typically born in large groups of stars called open clusters. Due to the higher density of stars in an open cluster environment, the chance for fly-bys goes up significantly as we go further back in time. But just how likely are they? To check this, the authors produced simulations of open clusters of the type in which the Sun could have formed, and checked for the likelihood of fly-bys like the ones they studied above. 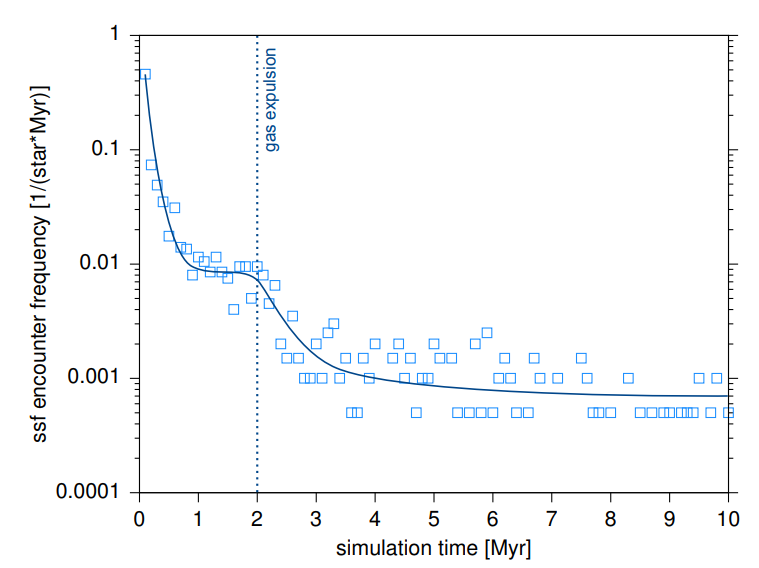 In Figure 4 below, they show that about 5-10 million years after the Sun’s birth, there is a probability of around 0.075% for a stellar encounter per million years. Aggregated over the first billion years of the Sun’s life, the chance of experiencing an encounter reaches 20%-30% – not that unlikely at all! Figure 4. The frequency of fly-bys that lead to a truncation of the disk around 30 AU, as a function of the age of the Sun. The dotted line at 2 million years signifies the gas expulsion phase of an open cluster, after which stellar encounters become considerably less frequent. Note that fly-bys before 5 million years should be disregarded because they do not allow enough time for the outer Solar System objects to form (figure 7 in the paper). Though today’s authors are still far from proving that a stellar fly-by caused the peculiar features of the outer Solar System, they demonstrated that it is at the very least a reasonable theory – one that can reproduce many observational facts, and one that is relatively realistic. So what comes next? The fly-by simulations produced a few additional predictions, mostly involving the detailed properties of orbits in the outer Solar System, which the authors are currently attempting to confirm against observational data. Ultimately, precise observations of more objects beyond Neptune hold the key to either strengthening or disproving the theory. This could have caused the Late Heavy Bombardment, right? And one in five planetary systems would be getting a similar bombardment early in their lives – if their stars formed in an open cluster environment.